This cute little Halloween bat has been made using a variety of commonly found seed pods. I’ve used an acorn for its body and Golden Rain Tree pods for its wings. 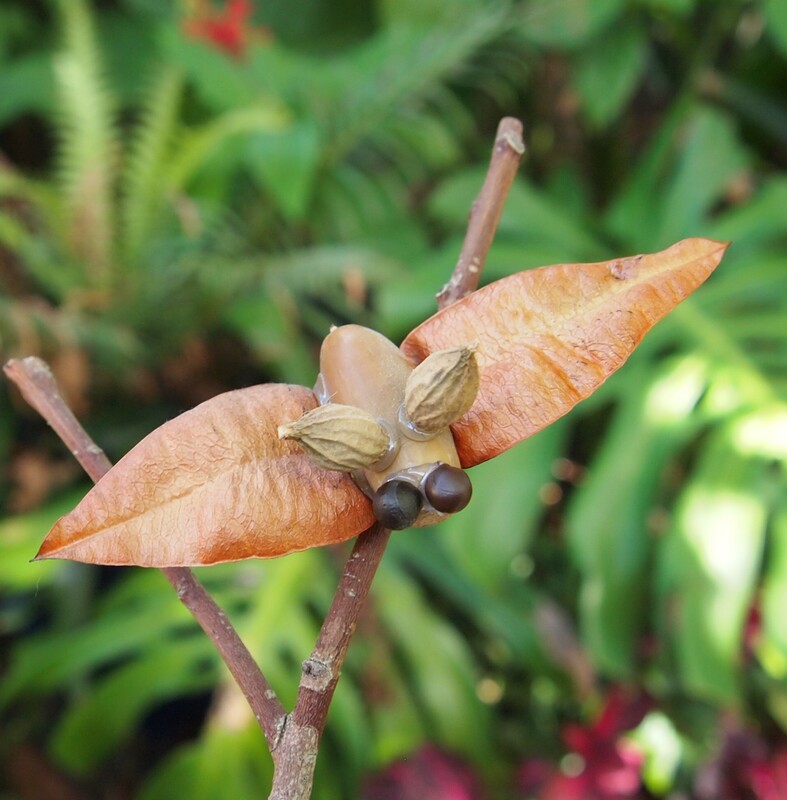 The eyes are little black Golden Rain Tree seeds, and its ears are made from small gumnuts. I’ve joined it all together using a trusty low-melt glue gun. Be sure to check out my Spooky Halloween spider too! 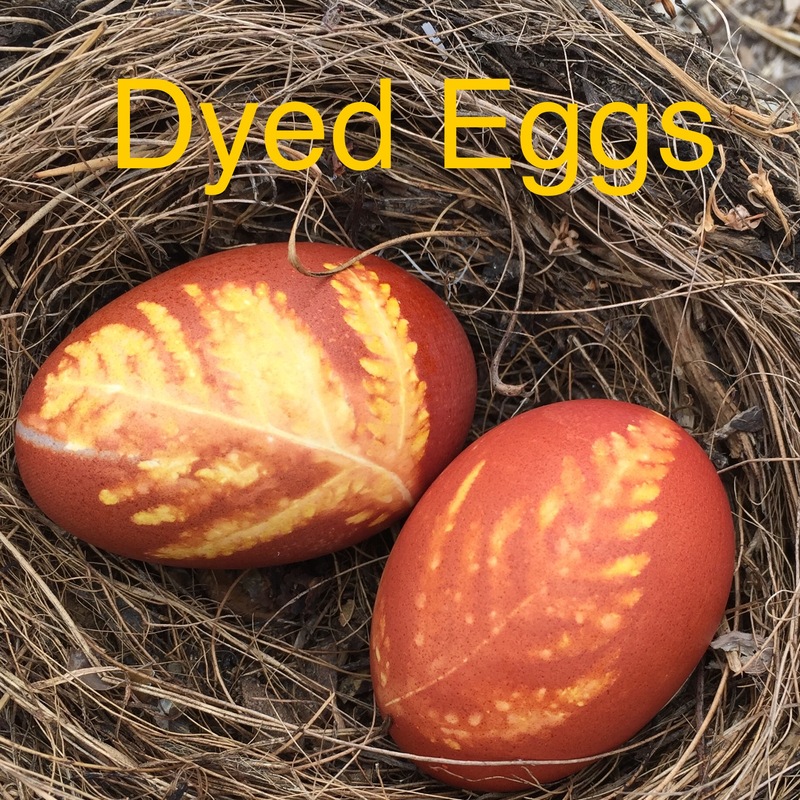 Making dyed eggs is a fun activity to do with your family or class at Easter, or anytime of the year! Pop outside and pick an interesting shaped fresh leaf. A piece of fern like this works really well. Then place your leaf on a white or light-coloured egg and wrap it tightly with an old stocking, and secure it with a rubber band. Place the wrapped egg into a saucepan of water. Add some dried brown onion skins and boil on your stove for at least 5 minutes. Then carefully remove the egg with a spoon or tongs and allow it to cool. Once cool, unwrap the egg and peel off the leaf to reveal a beautiful natural leaf print! You can try different dyes using other natural ingredients, it’s really fun to experiment! Try purple cabbage or turmeric to create different colours. There’s lots more interesting information on natural dyes in my book Nature Crafts with Common Plants. Check it out! These gorgeous Australian native marsupials have large pink ears and a long, thin tail. Once common and widespread, their numbers are now low due to habitat loss and predators, and sadly bilbies are now only found in a few desert and grassland areas and in captivity. Fantastic work is being done to protect bilbies, and more information can be found on the Save the Bilby Fund site, and the Rabbit Free Australia site. 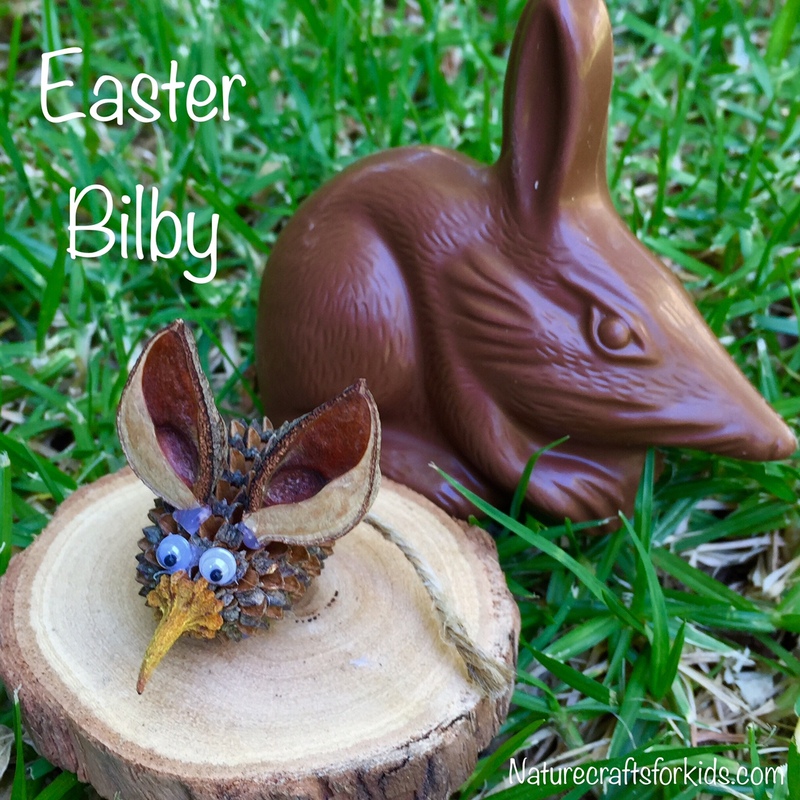 Celebrate bilbies, not bunnies at Easter. Unlike our native bilbies, bunnies are a destructive pest which have eaten native plants and damaged ecosystems across the country since they were introduced in the 1800’s. Further information on why we should be celebrating bilbies, not bunnies at Easter time can be found in this Australian Geographic article. Haigh’s Chocolates and Fyna Foods Pink Lady Chocolates make delicious and cute chocolate bilbies, and they donate part proceeds of sales to supporting the living ones! 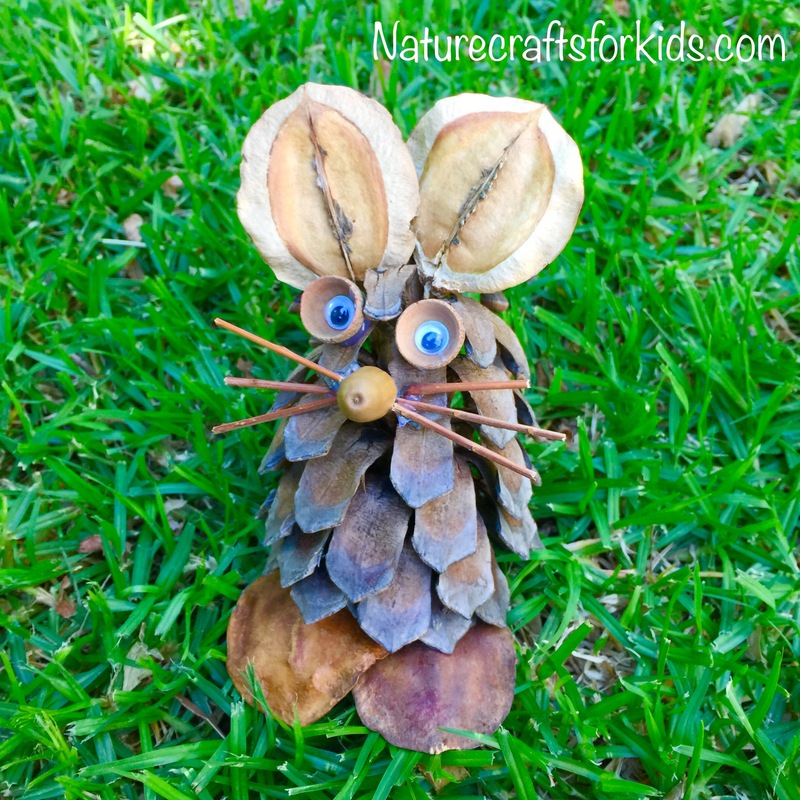 To create your own nature craft bilby, use a large gumnut for the body, a sheoak pod for the head, and attach hakea pods for ears. A coral gum cap makes a perfect pointy nose, and piece of string can be used for a tail. No hakea pods? No problem! You could use small leaves, pistachio shells or anything else that’s about the right size and shape. Glue everything together with a trusty low-melt glue gun. Pinecones make great bodies for all sorts of creatures, including Easter Bunnies! Just add some Jacaranda pod ears and feet using a low-melt glue gun. Glue on an acorn nose, and acorn cap eyes (I’ve added little plastic eyes inside), and some twigs for the whiskers. Done! 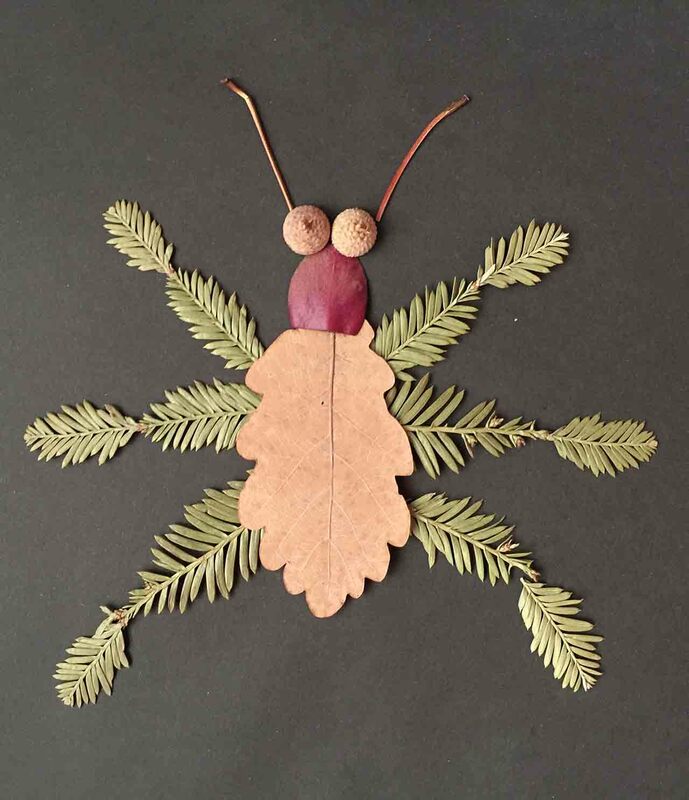 This collage has been created using an assortment of pressed leaves, sticks and a couple of acorn caps for it’s eyes. They’ve all been glued onto a black piece of paper which makes the bug really stand out. Leaves can be easily pressed in old books, or in a flower press like this, made from two pieces of wood joined with screws and wingnuts. The leaves are sandwiched between layers of paper and cardboard for a few weeks to dry out before use. For more inspirational collages, check out the stunning work of Canadian artist Rakou Inoue. Spring is here down under and my front garden is a mass of pink and purple flowers. 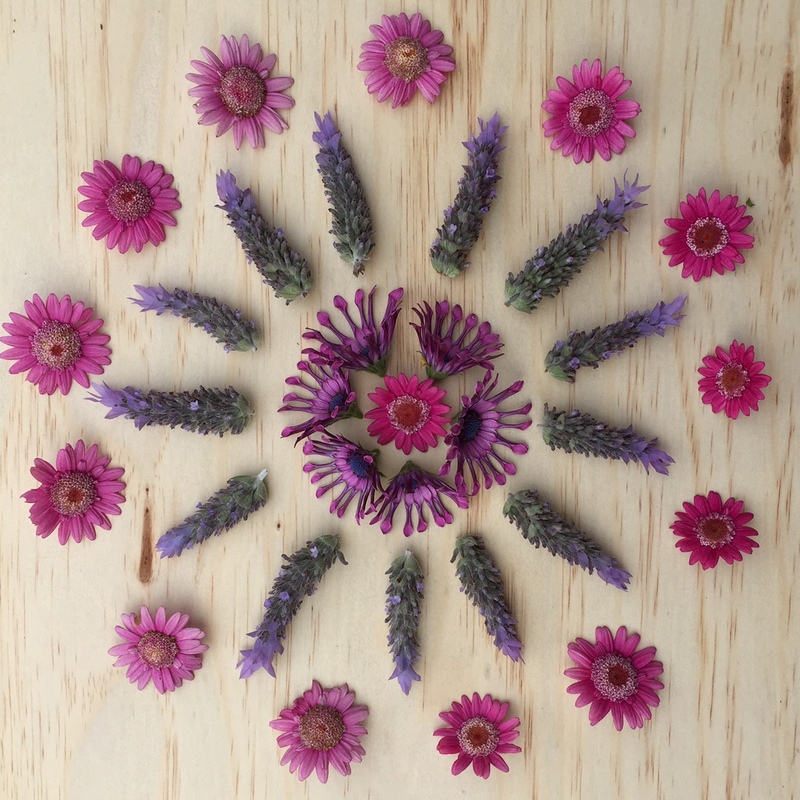 Perfect for a spring mandala!